Hey there! Thanks for dropping by deborahlmaldonado! Take a look around and grab the RSS feed to stay updated. See you around! This multi-genre research paper is about the sugar cane industry in Puerto Rico, focusing on the sugar mill in Ensenada better known as Guánica Central. My decision to write about this topic came to by pure chance. One day I was brainstorming to decide on what to write, but nothing came to mind. Then one Sunday afternoon as I was driving to El Malecon in Guánica I passed beside the chimneys of the mill and the idea suddenly hit me. It came in the form a question: what happened to the sugar cane industry? That’s how I decided on the topic for my multi-genre research topic. I started remembering on what I used to see when I was a child, the truckloads of sugar cane, the factories releasing the smell of freshly pressed sugar cane, and, when I passed the plantations, some workers. When I started my research I found only basic information on the sugar cane, not on the industry and how it came to be. As I continued my research I found out some interesting things about the industry, like it brought most of the economy to Puerto Rico. This is what made me decide completely to do the research on the sugar cane industry in Puerto Rico. I did my best so that in the introduction you get the feeling that you’re traveling to a time were the Puerto Rican people worked all day just to earn enough to sustain themselves and their families, most times is wasn’t even enough. The sugar mill that I’ll focus is in the town of Guánica, the Town of Friendship. Guánica Central was founded in the year 1903; just five years after the American soldiers entered the island through Guánica, as one example of the American mega corporations. Its establishment marked what would be a big economy impact to Puerto Rico in the first half of the twentieth century. I was captivated by the monumental chimneys and the ruins of the fallen buildings made of rusty zinc. These ruins were, in its peak moment, the principal precinct of the Sugar Mill known as Guánica Central. The area of the Central is a very dangerous zone so it is closed to the general public because of the instability of the ground and the unseen deep black water wells all over the area. You can marvel at the height of the chimneys from just across the street. There’s not much that’s still around of the central’s glory, but what’s there can tell a story. A broken down cyclone fence marks the boundaries of what’s left of the sugar mill, which ads to the eerie feeling you get by just watching the Central on a deserted and peaceful day like a Sunday. The monumental remnants of the Central sugar mill have been deteriorating over time giving the message that the sugarcane belonged to an era and an industry lost in Puerto Rico. The silence reigns, the only sounds are the musical notes of the wind passing through the Central fighting against time and oblivion. Let’s get up and make a travel through time trying to revive an important part of Puerto Rican history. Sugar cane was introduced to Europe with the Muslim conquests who planted it all the way from Sicily to Spain. In the 11th century sugar cane gained its golden age thanks to the invention of the trapiche. The trapiche is a mill composed of three crossed rollers which pressed the sugar cane, previously shredded, and extracted its juice from which the sugar is made. The first sugar cane roots planted in the New World were brought by Christopher Columbus to the Dominican Republic in the year 1493. In 1501 the first sugar cane field was put to production and in 1515 the first masters of sugar came from the Canary Islands to Puerto Rico. The sugar cane industry was officially established in Puerto Rico from 1873 to 1876. After United States won sovereignty of Puerto Rico in 1898 the sugar cane industry grew even more. Although the first sugar cane plantations were in home gardens just to be chewed on, the sugar cane was to become a big impact to the Puerto Rican economy for many decades. Badillo argues that the sugar cane industry was in charge of landowners and that their business would prevail or fail depending on the Spanish Crown. I agree with her because that’s the way it has been since history began to be written. The ones with money had the power to do whatever they wanted and no one could oppose them and it is through the enterprise that the Guánica Central was born and later died, but not without leaving a mark on Puerto Rican history. In the essay Centrales Azucareras en Puerto Rico the unlisted author states that the first sugar cane plantation for mass production was established by Don Fernando “El Católico” in the “Hato de los Reyes”, known today as Hato Rey. In Puerto Rico by 1934 there were approximately forty three sugar mills operating under a sugar quota of 909,445 tons. This quota was established by the Jones-Costigan Act, as Badillo informs. Between 1942 and 1977 thirty four centrals were closed down. The largest central survived just a few more years: Ensenada in Guánica was closed in 1981. The Central Sugar Mill in the sector Ensenada in the town of Guánica, known as Guánica Central, was founded in the year 1901, a few years after the Americans invaded Puerto Rico entering through Guánica. Many people say that because of this event that Guánica should have been Puerto Rico’s capital. The company behind its foundation was the South Porto Rico Sugar Company by the legal firm Muller, Schall and Co from New Jersey (Freytes). This company, being one of the dominant corporations in Puerto Rico for many years, was also in charge of the Roman Central in the Dominican Republic (AACUPR). The central’s planning was in charge of civil engineers Harris and Giles, including the port, the town and the production facilities (AACUPR). The sector of Ensenada, built around Guánica Central, was the first example of an establishment specifically for a capitalist corporation (Freytes). The houses of the central’s executives, the sugar cane workers’ homes and everything else for the community’s service in this sector were also part of Harris and Giles design (Freytes). Guánica Central brought a vast economy for Puerto Rico for most of the 20th century, based on the intensive exploit of the sugar cane for sugar production (Badillo). In its prime moment, until World War I, Guánica Central was the principal sugar producer and the largest in the entire world. It was also the only sugar mill in the Caribbean to receive cargo by ship, taking in advantage the bay’s characteristics and the port’s structure (Freytes). The central’s job was to plant, harvest, and process the sugar cane and market the final product. The process of one plantation usually took fourteen months, from planting until grinding. Replanting was done every four years or so (SKIL). “When the Land Use Authority and the Sugar Corporation were created during the 1940s, the Puerto Rican government acquired the Guánica Sugar Mill” (FPH). With this people began hoping that the industry would increase even more and better more the economy. When I was a child seeing the trucks loaded with sugar canes I thought that wouldn’t change, but in 2000 the last operating sugar mill closed, it was in Yabucoa. The sugar was then sent to refineries in the East Coast, but by 1950 refining machinery was brought to Guánica Central (Badillo). The central had a highly distinguished production record that lasted over thirty years. By the year 1976 its grinding record was of 536,801 tons of sugar cane. This produced 49,319 tons of sugar and 3,618,547 gallons of syrup (FPH). In the webpage titled Centrales Azucareras en Puerto Rico the author claims that this industry was what brought the food to our table for many decades and it should have not disappeared. To which I have two points of view. On the one hand, I think it was an interesting way of life and part of the Puerto Rican culture. On the other hand, the way the workers were treated wasn’t fair. One by one, the workers left Puerto Rico to the United States in searches for full time jobs and better wages. 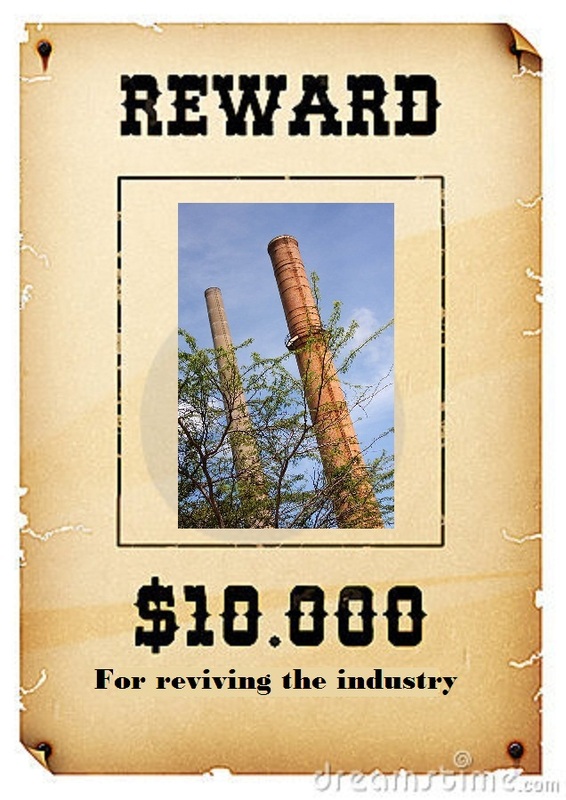 Bit by bit the sugar cane industry in Puerto Rico died. Finally, Guánica Central closed down in 1981, with the transition of Puerto Rico’s economy from agricultural to industrial. I believe it’s a good project for the town in economic and touristic ways, if it actually exists. To my current knowledge, nothing of the sort has started or been made public. Could it be that Guánica will become a spot well known throughout Puerto Rico once again? I chose to do this simple black and white collage from the sugar mill’s early years to show how magnificent it was. If you go today to where the ruins are today, you wouldn’t believe that what is shown in these pictures it’s actually Guanica Central. 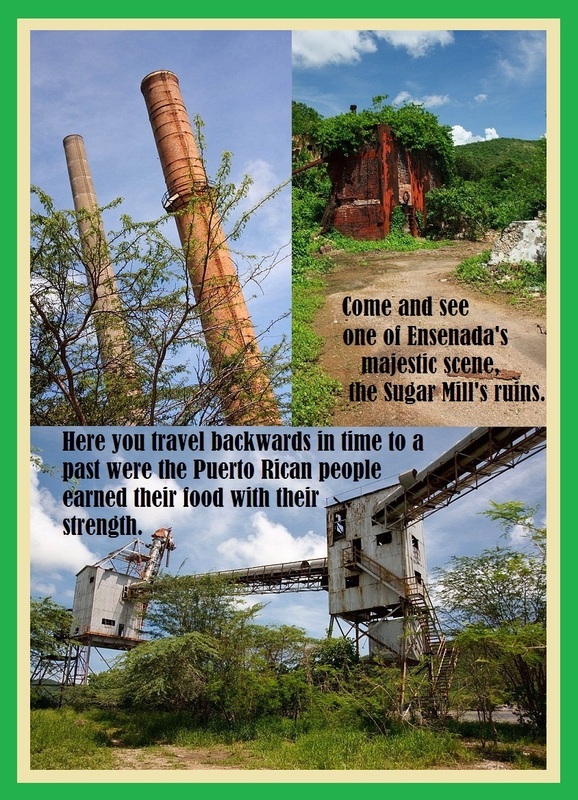 The Sugar Mill in Ensenada, known as Guánica Central, died in 1981 at the age of 80 in Guánica from being closed down related to a change in the industry. Guánica Central is preceded in death by its central siblings Playa Grande in Vieques (1942), Carmen in Vega Alta (1945), Caribe in Salinas (1946), Herminia in Villalba (1947), Santa Barbara in Jayuya (1948), Pellejas in Adjuntas (1949), San Jose in Rio Piedras (1952), Constancia in Ponce (1954), Rochelaise in Mayaguez (1957), Victoria in Carolina (1957), Pasto Viejo in Humacao (1958), Ejemplo in Humacao (1961), Constancia in Toa Baja (1962), Guamani in Guayama (1963), Juanita in Bayamon (1963), Plazuela in Barceloneta (1963), Canovanas in Loiza (1965), Santa Juana in Caguas (1965), Cayey in Cayey (1967), Rufina in Guayama (1967), San Vicente in Vega Baja (1967), Soller in Camuy (1968), Rio Llano in Camuy (1970), Lafayette in Arroyo (1971), Los Canos in Arecibo (1972), Monserate in Manati (1972), Juncos in Juncos (1973), Cortada in Santa Isabel (1974), Eureka in Hormigueros (1977), Fajardo in Fajardo (1977), Igualdad in Anasco (1977) and San Francisco in Guayanilla (1977). After Guanica Central, its last siblings followed its death soon after; Cambalache in Arecibo (1981), Aguirre in Salinas (1990), Mercedita in Ponce (1994), La Plata in San Sebastian (1996) and, finally, Coloso and Roig in Yabucoa (2000). It has no surviving relatives. Guánica Central was founded in the year 1901; a few years after the Americans invaded Puerto Rico entering through Guánica. The company behind its foundation was the South Porto Rico Sugar Company by the legal firm Muller, Schall and Co from New Jersey. Guánica Central brought a vast economy for Puerto Rico for most of the 20th century, based on the intensive exploit of the sugar cane for sugar production. In its prime moment, until World War I, Guánica Central was the principal sugar producer and the largest in the entire world. It was also the only sugar mill in the Caribbean to receive cargo by ship, taking in advantage the bay’s characteristics and the port’s structure. The central’s job was to plant, harvest, and process the sugar cane and market the final product. The process of one plantation usually took fourteen months, from planting until grinding. Replanting was done every four years or so. By the year 1976 its grinding record was of 536,801 tons of sugar cane. This produced 49,319 tons of sugar and 3,618,547 gallons of syrup. Services will be held this Friday starting at 8:00 pm in front of its ruins. The pictures in this travel poster show the sugar mill for what it is today: a historical monument of an important part of Puerto Rican history (Leyes de Puerto Rico…). Shred sugar cane stems and put them in a mill. Crush the stems until you get the juice. In a large pan, bring 3 cups of sugar cane juice to a boil, until it thickens, like a syrup. In a separate large pan, bring water to a simmer. Then add the white tea leaves, the grinding mill stick and zest of strength. Simmer for 20 minutes. Let cool for 3 minutes and strain into a large pitcher. Discard solids. Gradually stir in sugar cane syrup. Pour in a glass with ice and enjoy. Not really. I just think that it wold be nice that the sugar cane industry would flourish again in Puerto Rico. Obviously for the good of Puerto Rico. 1. Who brought the first sugar cane roots to the New World? 2. What were the first sugar cane plantations used for? b. To eat instead of rice. c. To be chewed on. d. To use as money. 3. When was Guánica Central founded? 4. What was the name of the company behind its foundation? b. Muller, Schall and Co.
5. Until when was Guánica Central the largest sugar mill in the world? 6. How long it took to process one plantation? 7. How frequent was replanting done? a. Every fourteen months or so. b. Every two years or so. c. Every four years or so. d. Every twelve months or so. 8. How long did Guánica Central hold its distinguished production record? 9. When was Guánica Central closed? 10. Why was it closed? a. Because of the gargoyle attacks that started that year. b. Because the workers reveled against the hard work and low pay. c. Because the sugar mill caught fire. d. Because of the transition of agricultural economy to industrial economy. Today the ruins of Ensenada’s sugar mill form a part of our working history, being visited by photographers trying to capture its magnificence and beauty. I hope you enjoyed this travel to the past to a way of life lost in time. Writing about the lost sugar cane industry in Puerto Rico has made me learn many important and interesting facts about this topic. I used to think that this industry was kind of an unfair one, where the field workers were abused by the extreme conditions of the field job, like the heating sun and overwork. I’m not saying that it wasn’t like this; I mean that aside from that the industry was a huge impact on Puerto Rican economy. Doing this multi-genre research paper was kind of fun. Researching to broaden my knowledge on this topic, and in turn broadening yours, doing the different genres was helpful. I tried to focus the genres I chose to symbolize the death of the sugar mill in Ensenada. The collage shows the sugar mill in its prime moment, the obituary speaks of the death of the industry, the travel poster invites to witness the gloriousness of the ruins, the revival tea recipe and the reward poster call for a revival of the industry, and finally the quiz is a means to see if you managed to learn something new. Knowing that Guánica Central was the biggest sugar mill in the world boosts my pride in being Puerto Rican, even though all sugar mills in Puerto Rico are nonoperational. This is how I hope many Puerto Ricans will feel when they finished reading my research. An extensive informative essay with a descriptive history on the sugar cane industry in Puerto Rico. This essay gives details on all the sugar mills in Puerto Rico since they began until they closed down. It provides black and white photographs and colorful photographs as well. This webpage has a short informative essay with a different view on the sugar can industry. It gives a short history on how the sugar cane arrived in Puerto Rico. How were the first machinery used to process the sugar cane. It gives important dates on the sugar cane history. This is a collection of black and white photographs from different angles on the Guánica Central in Ensenada. It is an ample collection giving the viewer different perspectives and angles on what was a majestic scene of an important part of Puerto Rican history in the first years of the 20th century. Ramos, Maria. La muerte de un gigante: historia de la central Guánica y el poblado de Ensenada. Puerto Rico: Caribbean Studies, 2006. 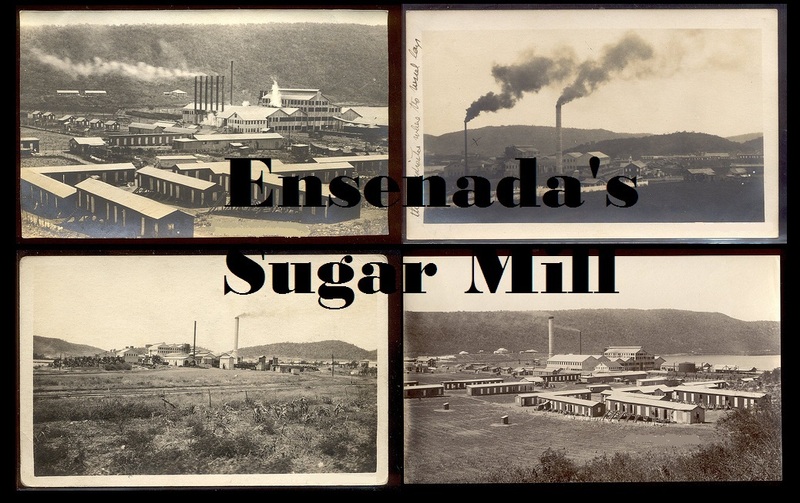 The title refers to the emergence and decadence of sugar mill in Ensenada, Guánica; commonly known as Guánica Central. This was the largest sugar mill in Puerto Rico and in the Caribbean, and, in a determined moment, the largest in the World. This book gives an ample bibliography of the sugar industry. It’s a contribution to the knowledge of the community lifestyle in Puerto Rico around a sugar mill. It calls to attention the social focus in the building and development of the sugar mill. This is a very detailed webpage that explains step by step the process to make sugar. The steps are the planting and harvesting the sugar cane, extracting the cane juice, evaporating the water from the juice to get syrup, boil the syrup to get sugar crystals, storing and, finally, refining. This process can take from two to four years on a single planting. Junta de Salario Mínimo (Puerto Rico) – División de Investigaciones y Estadísticas. La industria del azúcar de caña en Puerto Rico. Puerto Rico: La Junta, 1942. Menéndez, Rafael. Historia de la caña de azúcar en Puerto Rico. Puerto Rico: Departamento de Agricultura, 1937. Vendrell, Adolfo. La caña de azúcar: nociones sobre su cultivo y trabajo industrial. Puerto Rico: Tall. Tip del Asilo de Beneficencia, 1892. Zayas, Duhamel. La industria azucarera de Puerto Rico en fotos. Puerto Rico: Ediciones Situm, 2009. Your Multigenre thingy puts mine to shame. This history is awesome . My grandfather worked for this company in the year 1916 ,he was sent to la Central Romana in DR to teach the Dominicans how to use the sugar trains. His name was Eleuterio Rodriguez . Do you know where I can find documentation that he worked for the Guanica Central during this period. Greatly appreciated. Hi, enjoyed your history. I am looking for information on a relative who was a supervisor / managers at the factory for many years. (approx 1908 – 1930) His name was James Joseph Magill. Can you help? Very nice your revival of Puerto Rican sugar industry. But, you missed an very important issue. In the 70’s and 80’s an eminent researcher at the University of Puerto Rico, Dr. Alex G. Alexander, put much effort trying to change the focus of the sugar-based one. Notwithstanding his crusade, he failed. I have written a technical revision on this subject that you can find in <http://dx.doi.org/10.1155/2014/597275, or you can consult Dr. Alexander's book "The Energy Cane Alternative" at the university library. Very interesting however i would’ve liked to read more about the history before the war, although I assume that information would be hard to find. My grandmothers family owned the plantation at the time of the invasion, men were killed women were raped and their breasts were cut off. The name of the family was Familia de Flores…I would be interested in any information you can provide. « Armageddon: The End of a Period, The Start of a New One. Armageddon: The End of a Period, The Start of a New One. The glue in my family.